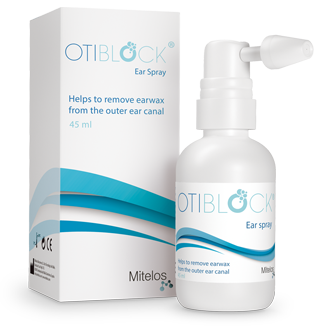 What is more, the OTIBLOCK® Ear Spray has been formulated to maintain the normal characteristics of the ear canal, in order to avoid further complications. When spray into the ear canal, OTIBLOCK® liberates oxigen and the bubbles in the liquid break the earwax plug down into small fragments. Furthermore, thanks to the product’s aqueous characteristics, the fragments are dissolved into even smaller particles, which may leave the ear spontaneously or be removed more easily by your doctor, if manual intervention is deemed necessary. The product drains away without leaving unpleasant oily residues. Unlike sea water and other saline solutions, OTIBLOCK® helps to maintain the physiological pH of the ear. OTIBLOCK® comes in a 45 ml bottle with a dispensing device. The active ingredient is hydrogen peroxide. This works by releasing oxygen, which breaks the earwax down into smaller fragments that are easier to remove. It may also prevent the need for ear irrigation (syringing). OTIBLOCK® is applied using a dispensing pump specially designed for use in the outer ear canal, as shown in the diagram. Tilt your head forwards and gently pull your ear backwards. Carefully place the applicator in the outer ear canal and press 4 or 5 times. Keep your head tilted forwards for about 5 minutes. Turn your head in the opposite direction to allow the liquid to drain away and dry. Clean the applicator with water and dry it. Keep it for future applications. • OTIBLOCK® will not interact with any other product or medicine that you may be taking. • However, do not use it with any other ear product at the same time. • The release of oxygen may cause a temporary bubbling sensation. • It has been reported that ear solutions may cause discomfort, hearing loss, dizziness and tinnitus. • Do not drive or use machines if you experience these effects. • An unpleasant taste in the mouth has also been reported on rare occasions. • Do not refill the container.